It's been a long time since I have last seen a C rating posted outside a restaurant. When I saw the sign, I was a little hesitant to come in but why not. Heck, I am in San Gabriel... it just means more flavor ^_- lol Just take it with a grain of salt. Battambang Restaurant caught my interest because it was a Cambodian restaurant and had great reviews. 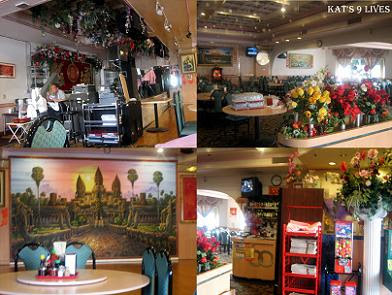 There isn't much to the decor that differs from your everyday Asian restaurant in SGV except the huge picture of Angkor Wat on the wall. Ms. Lin immediately whipped out her Blackberry to pull up her website to show us all her profile pic. We must have came during a down time as all the people working there were sitting around chilling and eating. They have a karaoke area/stage set up that probably could be live entertainment as well. It's actually a pretty big restaurant with lots of seating. The menu is pretty big and with lots of pictures, which compelled us to order more. Sadly, they were out of the Venison dish that Ms. Lin wanted. On the table there are a lot of sauces to choose from to boost the flavor of the dishes. I had to have a Durian Shake after I saw it on the menu. The flavor was only so-so and really sweet. It was a little too sweet for me and too little funk. I wished there was a stronger Durian flavor. The one at Newport Tan Cang Seafood is a lot more flavorful and pungent. Yes, Durian is an acquired taste so don't try a drink as your first time because it tends to be more funky than the fruit itself. With the lunch specials they bring their daily soup, which is a huge Pork Bone Soup. It was actually pretty flavorful and the meat was tender. The simplistic flavor of the pork bone resonates in the soup and brings out the natural flavor. Since the prices for lunch were very reasonable, we ordered a ton of dishes to try. Ms. Lin ordered the Salt Fish Chicken Fried Rice for $4.95. It wasn't what she thought it would be, but I thought the flavor was fine. The seasoning was light but still tasty and I couldn't taste the salted fish, which is probably why I thought it was okay and Ms. Lin didn't like it. =9 The portion is not bad and it's a great add on dish to everything we ordered. People on the internet recommend the Beef Stick, $7.00, and we decided to try it. Ms. Lin thought they were a little dry and wasn't what she expected. The meat was a bit chewy. I thought the flavor was good and it wasn't too tough that I couldn't finish it. They glaze the meat so it is on the sweeter side. It is very similar to the Thai Satay but bigger chunks and a sweeter glaze. For my choice of lunch dishes, I chose the Salt & Pepper Fish for $5.75. Every dish here was heavily colored. The fishes had a yellow batter that was not too thick but not as light as I normally like. There wasn't really much flavor in the fish except the outside seasonings. What really saved this dish was the side sauce of Lemon Salt & Pepper that was extremely tangy. Since they were out of Venison, we had t make a last minute decision as our final dish. I just chose their House Special Chicken lunch, $4.95. It's marinated, battered, and fried chicken. The flavor was decent. This really reminds me of Beijing Chicken. It is probably a light soy-based marinade and pretty easy to make at home. All in all the food was not bad and for the price... sure why not. *quoting Ms. Lin* I feel that the food is decent and they do have a huge menu to try but you can't beat the lunch special. Some of their dishes can get quite pricey so I recommend coming at lunch so that you have the option to pick some cheaper dishes and order 1 or 2 dishes off their regular menu.